What can we learn from the UFT Strike of 1968? How does it point the way to our future? I don’t know but I pretend to in this piece. New York City was undergoing major demographic changes in the 1960s. For the previous 20 years, the manufacturing sector that had formed the bedrock of the city’s economy was being hollowed out. Jobs that employed most of the unskilled white workers of the city were moving to other states, then to other countries. At the same time, blacks from the south and Hispanics from the Caribbean were entering the city in search for those very same factory jobs. The city’s people, both white and minority, would be doing battle in a new type of economy: the service economy. Unlike the manufacturing economy, making a living in the service sector required having an education. The city’s post-war mayors put programs in place to help people get their educations. A steadily booming economy, combined with federal programs like the GI Bill, allowed the city to invest in such programs. In a sense, this could be seen as a continuation of the old Tammany Hall tradition of providing social welfare services to otherwise underserved people. Tammany helped provide these services to immigrants, provided the immigrants voted Democrat on election day. The post-war mayors, serving in a post-Tammany New York, provided services to the children of immigrants. These second-generation Americans were divided into different ethnic and religious camps, the two main camps being Jewish and Catholic. The education programs put in place after the war were designed with these groups in mind. They appealed to the values and sensibilities of these groups, requiring good marks on standardized exams and proof of dedication to college work. Looking back now, the city was successful in helping the children of immigrants move up into the middle class in the new service-sector economy. On the other hand, New York’s newest minority residents were largely left out of these helping hand programs. That is not to say there were no programs in place for them. Red lining, urban “renewal” schemes and bad old fashioned racism helped isolate black and Hispanic residents in ever-expanding ghettos. While the children of European immigrants moved up into the middle class, the city’s minority population was trapped in what seemed like hopeless poverty. By the 1960s, then, New York City was a place of upwardly mobile whites and oppressed minorities. Nowhere did these two groups converge more directly than in the city’s public schools. Teaching had become a popular path to the middle class for these whites, especially Jews. Many of them had been educated in the CUNY system that supplied teachers to the public schools. As the years wore on, the students they served were increasingly drawn from the expanding minority population. These students, in need of an education so that they too could hope to find their way in the service sector economy, had high rates of failure, dropping out and illiteracy. Naturally, many observers blamed the teachers. There was a sense that the teachers did not respect or understand their minority students. A clash of cultures provoked many daily tensions in schools around the city, especially schools located in the most blighted inner city areas. These tensions finally came to a head in 1968. One of the plans for improving the performance of minority students was called “community control”. It was thought that turning over control of the public schools to local school boards would lead to an education more tailored to the experience and sensibilities of minority students. Community control was a key part of Lyndon Johnson’s War on Poverty programs. During the last year of his presidency in 1968, the mostly minority Brooklyn neighborhood of Ocean Hill-Brownsville tried their hand at community control of the public schools. Right from the start of the community control experiment, the Ocean Hill school district sent letters to a several dozen teachers informing them that their services were no longer needed. The teachers that got these letters were mostly opposed to the idea of community control. They also happened to be very active in the new teachers’ union, the UFT. While Ocean Hill might not have had a need for these teachers, they were told to report to 110 Livingston Street for a new assignment. This shows that the teachers were not fired, just involuntarily transferred. It sort of sounds like a 1960s version of an ATR. What happened next would rock the school system, the union and the city for decades to come. UFT President Albert Shanker called for a strike. In his mind, or at least his rhetoric, Ocean Hill had violated the contract. He essentially was willing to shut down the entire school system to protest a violation of the contract in one small part of the city. Shanker believed that allowing Ocean Hill to hand out involuntary transfers would set a bad precedent. The community control experiment came to an abrupt and ignominious end. Jews and blacks, groups that had been allies throughout the Civil Rights Movement, had a wedge driven in between them in NYC. According to Jerald Podair’s brilliant book about the strike, Jews would increasingly cast in their lot with the Catholics of the city, identifying themselves as “white”. Racial polarity in NYC was complete. Shanker had flexed his muscle. The strike alienated the UFT from many of the communities they served. Instead of relying on legitimacy from community partnerships, the UFT would from now on rely on the city, the Board of Education or, quite simply, “the “establishment”. Over the course of the next few years, Shanker would win many rights for his rank-and-file. The destinies of the UFT and “the establishment” became linked as never before. In return for “the establishment’s” largesse, Shanker would have to keep quiet about many economic and social justice issues for which he had fought early in his career as a socialist. In the years following the strike, the city was brought to the brink of financial ruin. All of the programs put into place after WWII had cost the city money that they just did not have anymore. A shrinking tax base and the unwillingness of banks to continue lending to New York City unless it paid its debts would lead to an era of budgetary belt-tightening. Indeed, New York City would practice austerity a few years before the rest of the nation. What would become a fundamental part of the Neoliberal coup of the late 1970s-early 1980s got its start in NYC. And while everyone’s belts were tightening, Shanker’s UFT reached its zenith. Teachers would get better protections, pay and benefits while most of the rest of the city was left to fight it out in the Neoliberal world that lived by survival of the fittest. The group hurt most by this would be the city’s poor minorities. During a time when they were most in need of a helping hand, the same type of helping hand that previous groups had received, they got little more than the cold shoulder. Neighborhoods like Ocean Hill, Bedford-Stuyvesant and the South Bronx would become national symbols for urban blight, reinforcing in the nation’s mind the belief that the people who lived in these places were beyond hope and undeserving of any type of government help. There is certainly much more to this story. However, from this we can start to pull out the lessons of the 1968 strike and its implications for the current education system in NYC. Shanker’s willingness to ally his union with management served him well in the short term. In return for being a good Neoliberal soldier, he was able to win for his union many of the benefits NYC teachers continue to enjoy. Indeed, part of the vitriol directed against teachers by the public today is the result of jealousy. You can hear it in many of the comments that are made, erroneously, about teachers: “Why do teachers get to have tenure?”,”Why are teachers not held accountable?” “Why are they entitled to a pension?” These are the words of a labor force ground down by a ruthless Neoliberal work environment, one hostile to unions and the public sector in general. Instead of asking themselves “how can I get that at my own job?” or “what’s wrong with the non-unionized workplace?”, they gain more delight in seeing others suffer just as much as they are. This is proof of victory for Neoliberal propaganda that seeks to get working people to believe that what is good for the billionaire is good for themselves or, more frequently, the billionaire’s suffering is the suffering of all of us. Americans today have been trained to “Pity the Billionaire”, in the words of Thomas Frank. Unfortunately, the long-term implications of Shanker’s decisions have been disastrous. What the establishment giveth the establishment can also taketh away. NYC teachers would enjoy their protections as long as mayors and governors adopted a sufficiently friendly posture to the UFT, a posture born out of the union’s ability to make substantial campaign contributions. However, as time has gone on, union contributions have increasingly been drowned out by corporate contributions. Since Shanker, political leaders have seen less and less of a reason to fear upsetting the UFT. This becomes much worse if, within this environment, we get a mayor who is independently wealthy enough to not need anyone’s contribution. We have had this in NYC with Michael Bloomberg. He has shown us how easy it is for the establishment to cut off its life support for public school teachers. The uneasy alliance that nurtured the rise of the protected, decently-paid teacher has broken down. One would think that the UFT or, more specifically, the Unity Caucus that controls it, would adapt their strategy to this changing environment. Instead, they have blindly carried on in the path that Shanker delineated 45 years ago. They continue to hitch their wagon (as well as ours) to the establishment’s star. Their justification is “well, if we don’t bend then we will be broken.” It is why the UFT supports mayoral control, charter schools, testing and other hallmark programs of Neoliberal education reform. The only problem with this is, whereas before the Neoliberals had a use for the UFT as a campaign contributor and even legitimizer of Neoliberal policies, the establishment now has absolutely no use for the UFT. That is why charters and online learning have gotten such a push. The goal is our complete destruction. The fact that our leadership continues to ally themselves with the establishment boggles the mind. They are helping guide the knife towards their own throat. Therefore, the only other alternative is one that also might have been available to Shanker 45 years ago. The UFT has to unhitch the wagon from the establishment and start hitching it to the communities we serve. Unlike in Shanker’s day, the communities we serve today are almost entirely poor minority. Unity, not to mention every other teachers’ union with the exception of Chicago’s, have allowed the Neoliberals to beat them to the punch in dressing up their aims in the language of civil rights. The privatizers want to close the “achievement gap”, provide better “outcomes” and ensure that teachers “add value” to their students. As we know, this is merely doublespeak to mask an ongoing quest to destroy public education for good. It is the same type of doublespeak that has gotten the American worker to Pity the Billionaire. However, the million-dollar question is how to hitch our wagons to the communities we serve. In 1968, the answer could have been to accept community control of school districts. Indeed, this seems to form part of the MORE platform. Giving parents and community members autonomy over, or at least a say in, the education of their children is a sensible approach to truly improving “outcomes” for our neediest students. At least, that is what it seems like on the surface. Upon further reflection, community control may not be the answer. It may be part of an answer or it might not be part of it at all. Community control failed for more reasons than the UFT Strike of ’68. It failed because its justification rested on a group-oriented, tribalistic outlook about race that alienated many of its white supporters. This is the part of MORE’s platform that will cause them the most trouble. We have already seen it with the criticisms of UFTers like Chaz who fear that their social justice causes are eclipsing their teacher protection causes. Despite the righteousness of many of MORE’s stances, they will not get off of square one without the support of the UFT rank-and-file first, a rank-and-file that is still overwhelmingly white. Furthermore, race in the 1960s is not the same as race in 2013. It is not just poor blacks and Hispanics who have been hurt by the Neoliberal school agenda. NYC schools have seen an increasing influx of Asian, Eastern European and African students, all of whom stand to lose out if public education disappears. To a large extent, these “new immigrant” groups also face tremendous poverty. With the exception of maybe Eastern Europeans, their skin colors do not allow them to benefit from the white supremacist assumptions that still undergird many of our institutions. On issues that relate directly to these students, students who represent groups that do not fit into the neat black/white dichotomy that we like to take for granted in the United States, both Unity and MORE are silent. Community control in 2013 just might mean allowing each ethnic enclave in the city to control its own public education destiny. There can be schools for African-Americans, Puerto Ricans, Chinese, Filipinos, West Africans, Indians, Pakistanis, Bangladeshi, Indian and so on until we are atomized into numerous cultural groups. The question is, however, do we really want to do this? This leads to another, more important question: should our union advocate for African-American causes, causes that might nobly seek to right many of the wrongs of a past with which we still live, to the exclusion of every other ethnic group? Of course, most people would answer “no” to this question. This, then, brings up the next important question: should our union, no matter which caucus is in control, combine the interests of all of these groups into a vague “minority” platform, or do we advocate for the interests of each of these groups as their own groups? The former will cause resentment by subsuming everyone’s unique ethnic identity under an amorphous “minority” idea that might have no legs to begin with. If it is the latter, how do you balance these claims without making any one of these groups feel marginalized? Another of the justifications for community control was that schools controlled by poor minorities would reward student behavior that the wider community valued. The values of hard-work and factual knowledge served the middle class whites of the 1960s well because society rewarded them for those traits. On the other hand, values in the minority community like peer loyalty and collaboration are not rewarded in the wider (and whiter) society. Community control would allow minority students be rewarded for the “currencies” they already brought to the table, rather than trying to force them to adopt middle class values. Quite simply, whatever answer the UFT comes up with on how best to engage the communities we serve will have to be a “post-racial” strategy that breaks out of the simplistic black/white paradigm. This is not because racism no longer exists, since it obviously does and in even more insidious forms. This is because our understanding of race is undergoing a major shift. With the continued increase of interracial families, the lines between all of the groups mentioned above will continue to blur. Unity does not speak on race at all and MORE’s racial speech is caught in the quaint 20th century. Tribalism is and should be much less prominent now than it was in the 60s. How to achieve a post-racial strategy without submerging all of these unique groups under amorphous rhetoric is difficult. Trying to retain that streak of ethnic tribalism without atomizing and alienating each other is also difficult. For now, I would be happy to see my union leadership engage their communities using the language of class until a true post-racial strategy can be conceived. We live in an era when the Great Recession seems to be on a permanent low hum in the background. Poverty will continue to worsen as the economy stagnates under the weight of the low-wage jobs that the media tells us herald our “recovery”. Failing to address issues of class continues the Albert Shanker path of acquiescence in the Neoliberal agenda. One thing is for certain: we are still wrestling with the Ghosts of ’68. Many of the chickens from that time are now coming home to roost. Our union and our school system are unprepared for what will follow, since what will follow will be new and different. The quaint handles we use now, handles that were devised in the days of Albert Shanker, are just not going to cut it anymore. Examining the ’68 strike shows us why so much has gone wrong over the past 20-30 years. Learning its lessons will show us what strategies and handles are useless for us now in 2013. Although it will not give us solid answers as to what needs to be done, it will perhaps point the way towards where an answer might start to be built. This entry was posted in An Embattled Career, education reform, Politics, School, teaching and tagged Albert Shanker, education, History, Movement of Rank and File Educators (MORE), New York City. Race and Education, News, Politics, School, Unity Caucus. Bookmark the permalink. While I agree with much of what you say — and as a participant in the 68 strike and following that as an activist within the community I taught in, I have seen this from many angles. The MORE platform calls for some element of community control but there is certainly a wariness here on the part of many of us. I do not think it calls for anything like the comm control of 68. We are talking much more about school level parent/teacher control — maybe a dream but a worthwhile dream. I mean what is the alternative to mayoral control? The devil is in the details. But removing the influence of political forces, including the so-called “community” i have seen over my years and the UFT is a worthwhile effort. Can you support seniority and tenure AND have a community control hiring and firing based on other factors? And the answer is never clear but certainly we need to work these things out to my and I’m sure your satisfaction. As we see in LA where Bloomberg gave a million bucks in the school board election holding such elections is subject to money. Don’t forget that we did have the UFT version of comm control from 69-2002 when the mayor took control. I worked under that system and there were many minuses but it was still a better system than we have today. So I personally am for some kind of bottom up system where the school community choose the principal — and if teachers are not involved in this process I am not for it bec I have seen abuses of a community without teacher voices. I think MORE — and why I am in for this — needs to articulate what I would call “teacher/parent power. I personally lean toward the teacher part (maybe not being a parent) while others in MORE lean toward the parent part. But that is the essence if internal debate which needs to take place in a less than year old group. Hope you are part of that. Yes, I agree with everything you say here. I suppose the community control thing was more of a lens through which to view how MORE views race. For example, the disappearance of the black educator is a problem and a worthwhile problem to try to solve. Do we do this, however, by demanding more black educators or just more educators who are from the community? If we say we need more black educators, then we are giving preference to black educators even if they were born and raised in Beverly Hills or Levittown. That, to me, doesn’t solve the problem of having teachers in the classroom who truly understand and can communicate with students. So, I suppose the discussion I was trying to have surrounded the idea of race in general and how it seems MORE at times is stuck on a quaint, 20th century racial model that calls for things like affirmative action, etc. There are a whole bunch of students in our system who are struggling who are not black. What about the West African student who is not considered African-American and does not consider themselves African-American? They too are from a culture that was decimated by slavery in the U.S. and maybe they too should get some compensation for those past injustices. But where are the programs for these students? This doesn’t even begin to touch on Albanian, Chinese, Polish, Pakistani and other children who are being underserved. I think MORE is right to call for restorative measures for certain groups, but limiting those groups deserving of those measures will only end up alienating every other group. Isn’t this what happened with community control? Shouldn’t we try to avoid this instead of running headlong back into the same brick wall? Maybe I should write another post that touches just upon that idea. This is, I think, an important discussion to have, as you have said. 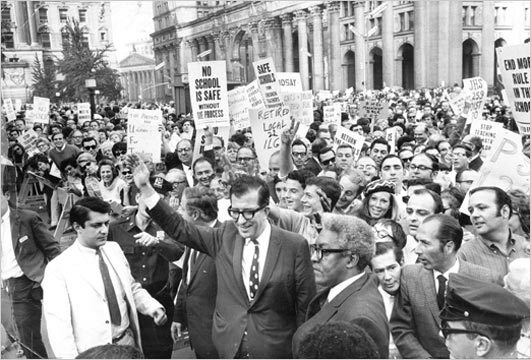 Shanker effectively won the ’68 strike, in that we never had community control in NYC. What we did have was decentralization, in which some of the functions of the old Board of Education devolved to the community school districts, at least for for elementary and middle schools. High schools had administration centralized on the borough level (which in my experience, coming in near the end of that era, worked fairly well). Today, It’s almost impossible for us to imagine a world where teachers would go on three city-wide strikes – the strikes were “settled” twice, only to have those agreements collapse – that lasted almost until Thanksgiving, because of the involuntary transfer of a small group of teachers (although on more than one occasion I’ve heard the union leadership falsely claim those teachers were fired). Different times, different city and, whatever your opinion about the ’68 strike, different union. Yes, certainly a different union, one much less inclined to fight for our rights. It seems to me that Shanker’s heirs haven’t found a way to properly wield their influence the way he did. The Podair book (which I lost in Sandy) is a great starting place but so is the Kahlenberg Shanker bio worth checking out for a one-sided but also informative view. Shanker may have “won” the strike but he was damaged very much by it and I believe he became gun shy after that culminating with his sell-out to ed deform with Nation at Risk in 82 and his ed alliance with Reagan and then the Clintons even in Arkansaw. While Kahlenberg is lauding Shanker for his “astuteness” in seeing which way the wind was blowing he misses the irony that Shanker began to lay the seeds of the destruction of the very unions he helped found — even if misinterpreted the idea of charter schools was his and opened the door. Randi certainly learned her lesson and began to take the union down the path of ed deform. They won’t oppose charters I believe because they have nightmares about 68. At least, my recent far out thoughts on their motivations. Maybe Shanker did read the political winds correctly. The 80s was a time of corporatism and he certainly ran the union on the corporate model. Like most big corporations, the UFT/AFT became, as you say, “gun shy”, averse to taking risks and instead relied on back room politicking to solidify his gains. Maybe I’m paranoid, but I always figured Shanker for a mole from day one. It was the time of J. Edgar Hoover, so that certainly might be a possibility. Read George Schmidt’s 1977 pamphlet on the AFL/AFT/Shanker and the CIA. I posted it in scribd. When you raise this: should our union advocate for African-American causes, causes that might nobly seek to right many of the wrongs of a past with which we still live, to the exclusion of every other ethnic group? On the surface one would say UNFAIR to other ethnic groups. But how can we compare any other ethnic group to Black native Americans (vs West Indies and African) given that when you start digging it is only a relatively short time since they were chattel. And then a hundred years of very heavy racism followed by another 50 of fairly heavy racism that no other group experiences. Asians may be poor but they did not on a massive basis have their entire family structure destroyed for centuries. So even though my sense of fairness rebels, I have to say that is a different story. And I agree with you. No group has suffered as greatly as blacks and Native Americans in the U.S. I guess the key of my question is “to the exclusion of” other ethnic groups. Asians have been discriminated against too. Muslims are now being targeted like never before. Even Jews and Catholics faced bigotry. Each group’s needs has to be addressed in the appropriate way. What I see MORE doing is focusing EXCLUSIVELY on one group and really being totally silent on every other group. This is why I say it is a very quaint, 20th century view on race. We have a long way to go before we right the wrongs of the not-so-distant past for black Americans. But righting the wrongs for blacks opens the door for righting the wrongs for everyone else. Just like community control in the 60s. When one group claimed privilege to use it, other groups followed. I hope this makes sense. This country not only refuses to face it’s shameful treatment of black Americans, we have entered a stage where many people think we have “done enough” or even gone too far. I would say we have been living in a white backlash for the past 30+ years. But I, in good conscience, cannot call for restorative measures for one group without calling for the same for every other group. Sure, black Americans and Native Americans require MORE of these measures, but that doesn’t mean other groups don’t require any. As a side note, I will say that Native Americans have been totally left behind in these calls for restorative justice and continue to be locked into hopeless situations. And then the other part of me fears going too far with seeing people as part of groups which then takes the focus off the issue of class. On the one hand, I suppose it is fair to say that certain people have been oppressed by virtue of being part of a group, so they should have reparations for being part of a group. The other part of me believes that the whole concept of “group” is a problem and the groups as we know them in America today have been really the conjuring of powerful white people. Therefore, when oppressed people talk of themselves as part of a group, they are adopting labels that white racists themselves coined to oppress them. Embracing those labels I think ensures that these groups will always be oppressed. This is how thorny the issue is in my mind. I wish it was as simple to me as it seems to be to others but I just can’t simplify it no matter how hard I try. So I am not sure how MORE is focused on one group. What I do hear is MORE people concerned about the relative lack of diversity within MORE. As to the loss of black teachers in NYC, no other ethnic group has lost teachers to such an extent which makes for an interesting analysis. Why? We have to be honest. Though every single group has issues, the level of racism directed at Black people far outweighs any other group. Is it possible that race plays some role in the lower numbers of black teachers? Look at TFA. They want a certain “style” and that is often white, ivy league. If they get a black from an elite college they will grab them but black ivy grads have a lot of options. What they don’t want is the kinds of teachers I worked with — neighborhood people who went to my school and worked their way up from school aide to para to teacher. Given they were educated in a school like mine they may not have had the King’s English but many were excellent teachers and knew the kids and the neighborhood. Now the DOE doesn’t want them and in fact the DOE and TFA don’t necessarily go recruiting in CUNY where these students would be available for teaching jobs. So to slim this down, while I am not totally in line with all the social justice themes in MORE I also feel there is rampant racism against Blacks in this country as there is not against any other group. Again, I largely agree with what you say. The lack of diversity in MORE is probably largely due to the type of discrimination found in the DOE.There isn’t much diversity to be had in the DOE and that is reflected in MORE. I would venture to bet that MORE is proportionally more diverse than the DOE as whole. You hit the nail on the head as far as the reason the DOE has been hounding black teachers out of the system. My view has always been that, in order to solve this problem, we must call for educators that come from the communities they intend to serve. I think calling for “black” educators in general, it doesn’t totally solve the problem, which is having teachers who can relate to the kids. A black educator from a middle class or wealthy background will most likely have similar types of problems than the white middle class or rich educator. Making it a community thing will, through sheer numbers, ensure that black educators return to the classroom. I am particularly sensitive to this issue. Since I grew up poor in an area that might be deemed “inner city” where my friends, babysitters, etc. were all minority, I feel I have an advantage in dealing with my students. I am able to build a rapport with them. It is one of my major strengths as a teacher. This is because I am from the places where many of my students are from. I can communicate with them and envision what they go through at home. I agree that community as a source of teachers is important and the antithesis of ed deform. My teaching community was about 65% latino and the rest black. The teaching staff was mostly white but that began to change as the career ladder program worked. But what is interesting is the drop in black teachers in NYC and Chicago and probably other places, known as the “disappearing.” I think it appropriate to question what exactly is going on and to call for recruitment given the proportion of students who are black and increasingly unlikely to see a black teacher. What message does that give to them? I try to think of the reverse — if I were in an educational situation of all black teachers and administrators and how that might affect me. Certainly… There is a 21st century dog whistle that must be called attention to, especially many blacks themselves have been associated with it: Walcott, Brizard and even Obama.It is a tough sell to a very stupid country. The one caveat here is the changing demographics of the city, which is also a product of racist policies like the disappearance of low income housing and stop and frisk harassment. We need more Chinese, Muslim, Albanian, Polish, West African teachers as well, since these are all groups that have been increasingly represented in the student body. This is why, again, calling for a tie between teachers and community is important.The teaching force should at least aspire to reflect the student body it serves.